• Impressive compact cooling capacity of 160W TDP. • Four high-performance 6mm heat pipes carry heat from the nickel-plated copper base plate to the optimal locations on the cooling fins. • Support of additional 120mm fan for enhanced cooling performance (free fan clips are included in the scope of delivery). • A silence-optimized 135mm be quiet! fan supports the best balance between cooling performance and quietness. • Fan provides smooth operation thanks to nine airflow-optimized fan blades and durable rifle-bearing technology. • Even at 100% full fan speed, overall noise is a scant 23.7dB(A). • Compact design saves space and allows for easy access to RAM banks even within the tight confines afforded by some compact PC enclosures. • Brushed aluminum finish on top cover. 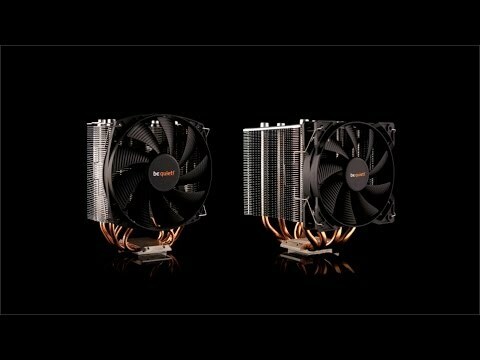 Features • Very high cooling capacity of 160W TDP. • Compact and space-saving slim design. • Four high-performance 6mm heat pipes carry heat from nickel-plated copper base plate to optimal location on the cooling fins. • 135mm silence-optimized be quiet! fan (max. 23.7dB(A)) with nine airflow-optimized blades and durable rifle-bearing technology. • Brushed-aluminum finish on top cover. • Compatibility with Intel and AMD sockets. be quiet! BK01 Shadow Rock Slim, Compact Single Tower CPU Cooler, 4 Heatpipes, 1x135mm PWM Fan, 160W TDP Intel/AMD CPUs is rated 4.8 out of 5 by 4. Rated 5 out of 5 by Massive from Silent, excellent cooling 135mm fan is huge but this slim version fortunately helps it to fit in my mATX case. The slim version is still "enough" cooling efficiency, the fan on mid speed was enough to keep my processor around 35-40C even while utilised 100% on a benchmark. My case does have excellent cool air intake and airflow so less efficient systems might see temps a few degrees higher, but the 135mm fan on this cooler is obviously powerful enough to not require full speeds unless you're doing serious overclocking (I am running a 4690k at stock speeds). At these speeds the fan is inaudible unless I have my head next to it. I expected some noise at maximum processor load but I don't even have that, so this cooler is even better than I was hoping. Rated 5 out of 5 by TheBoar from A beautiful object This is a beautiful cooler. When I got it I showed everyone, including people who don't care about computer components (yes they exist) and they all agreed with me. A work of art. Rated 4 out of 5 by Parmo from nice and cool just a quick one, keeps my i5 2500k at 20-30c idle and max 55c on load so happy with that. The promlem was that it was shipped and came out the box bent at the top. Poor shipping from DPD and the packaging from scan was poor.